Cheap Linux KVM VPS Hosting with free webuzo control panel. Manage your VPS without any worries! We promise No price hikes while renew! NOTE: All VPS are unmanaged. Delivered within 24 hours after payments. One-time setup fees are applicable (no setup fees for yearly purchase). Offer is for Yearly purchase. All our VPS comes with Premium Webuzo control panel. Now its easy to manage your VPS without any worries! Managing a VPS server is super easy with 3clouds. All our VPS comes with Premium Webuzo Control Panel (worth ₹250/month) at no additional cost. 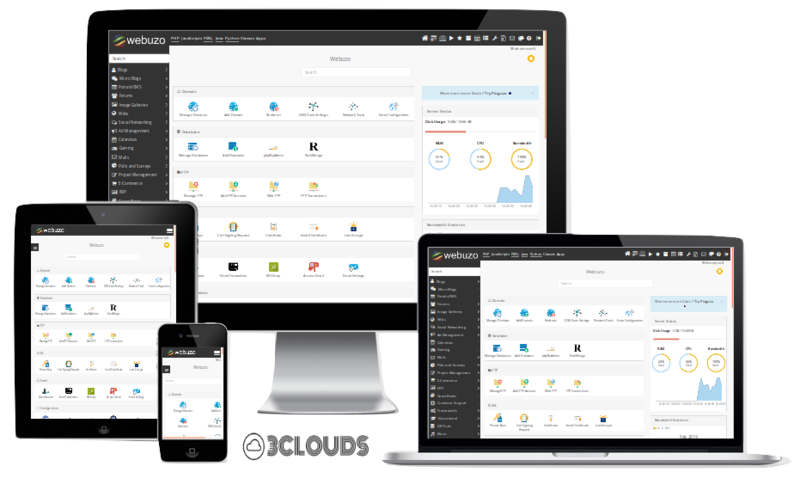 Webuzo is the most used control panel for VPS Hosting. It is provided by Softaculous. You can install apps like WordPress, Mgento, Drupal, PrestaShop, OpenCart within a click. You can easily manage your server from anywhere without command. Simply install php versions, SSL certificates, CSF Firewall, Nginx, Perl, Tomcat, Apache and more. You can install more than 400 scripts with a single click. Cheap unlimited web hosting from best web hosting company India. Get domain for lifetime + daily backups + website builder + SSL certificates in cheap price. Cheap VPS hosting India is provide by 3clouds. In the price of shared web hosting you have your own personal server. You do not have to share your resources (such as space, RAM etc) with others. Get amazing performance with high-end cheap VPS hosting. While other companies increases their price frequently, 3clouds cheap VPS hosting keeps price affordable to each and everyone. Our moto is to provide cheap vps hosting in lowest price ever. Cheap VPS hosting India comes with dedicated resources. We guarantee for RAM, CPU, DISK and Bandwidth usage. High-end VPS comes with unmetered bandwidth with high-speed network. Now you don't have to worry about resource usage. You will use full resource which comes with your VPS server. Wheather other providers limits the bandwidth to 1TB, 2TB or 3TB we are providing unlimited bandwidth to each and every VPS Hosting. Cheap VPS Hosting by 3clouds provide free SSL included into your control panel. Wheather you are using cPanel or Webuzo both are equiped with free SSL certificate. If you are using pre-installed Webuzo control panel you can use Let's Encrypt SSL certificate for free! Install unlimited SSL certificates and secure all of your website with data encryption. If you are using cPanel/WHM then you have Auto SSL to install certificate provide by cPanel. 3clouds Cheap VPS comes with pure SSD storage. SSD (Solid State Drive) is best for read/write speed of data. It will increase your website or application speed. It helps you run your website smoothly without any problem. You will get cloud speed with solid state drives. Now keep your application with super fast IOPS. Where other companies provides SAS or HDD we are one step ahed with SSD. Get the best SSD VPS Hosting from 3clouds. Intel Xeon CPU is enterprise grade processor which is specially built for servers. All of our Cheap VPS powered by intel Xeon CPU E5-2630v3, E5-2630v4 or 4114 processor (which one is available during order placed). It will provide seamless performance without any inturupption. Now it has more power than any other device. Your application or websites runs more smoothly than ever! Get our cheap VPS Hosting poewred by Intel Xeon CPU. You have full control over VPS. You have full root access which you can change the password to keep your server to your own. You can easily connect the server using SSH with Putty. Install 400+ application within a click with Softaculous. Included into our VPS Hosting. Now install and manage any apps like WordPress, Drupal, Magento, OpenCart easily. All our VPS Servers are fully DDOS protected. All the outbound traffic from bad IPs will bypass the server firewall. We have datacenter based firewall protection with upto 500 GBPS DDOS protection. Q. What is VPS Hosting? Ans. VPS or Virtual Private Server is a semi dedicated server with powerful dedicated resource to host your web application or high-end websites. Q. Who should use VPS Hosting? Ans: Anyone can use it. If you have a large website with millions of views, you must choose this VPS hosting for your website. If you are a developer and has 100s of client websites, you should choose this VPS hosting and have all access on the server. Q. How many websites can I host into VPS STARTUP? Ans: Hundreds of websites you can host with 8GB RAM easily. Q. Do you provide free SSL certificates? Ans: Yes. We provide free Let's Encrypt 256-bit SSL for all our VPS Hosting customers. The SSL plugin is included into webuzo control panel. Q. How many page views can handle a VPS Hosting? Ans: Our lowest VPS hosting can manage millions of pageviews per month. With 200 MBPS to 1 GBPS bandwith you do not have to worry about pageviews. Q. Do you provide free control panel? Ans: Yes, all our VPS Hosting comes with free webuzo control panel. Q. How easy to manage a VPS? Ans: It is very easy with free webuzo control panel. Installing any application or installing any software is super easy from the control panel. Q. Do you support installation of OS and webuzo control panel? Ans: Yes, all our vps comes with CentOS 7+ and webuzo control panel pre installed. You just need to login and start manage. Do you support for any problem into my VPS? Ans: We will support through ticket system for your VPS. As this VPS is fully unmanaged, mean you are on your own. We do not login or do not check inside your VPS ever! So if there are any internal problem, we will guide you for that. You have to do it on your own. Can I have different OS such as debian or ubuntu? Ans: Yes, if you need different OS, you can request us to reinstall and we will be happy to do that for you. But the free webuzo control panel will not provided with other OS. Q. Do we have full root access? Ans: Yes. you have full root access on your server. As we said before, this is unmanaged server so you are all in control. Q. Can I install cPanel/WHM into it? Ans: Ofcourse you can. Buy a cPanel/WHM license from us and install it! Ans: We accept all types of Debit/Credit cards, Net Banking, Wallet, paytm, Paypal (for foreign customers) and Direct Bank Deposit. If you want to pay directly to bank by NEFT please check our payment methods for the bank details. Q. Is there any refund for VPS Hosting? Ans: Yes we will refund on conditions. If you purchase a VPS for a year and we will refund you for rest of the month. A month will be considered as from your purchase date. No refunds for monthly price. If you use the VPS for one day, you have been charged for whole month. Have more questions in mind? Compare VPS Hosting price with other companies! Can you beat the price?